Way, Daniel. Deadpool: Evil Deadpool. New York: Marvel Characters Inc., 2011. I know this author to be reliable because he received the Xeric Foundations Grant in 2000 for his first publication, Violent Lifestyle #1. Through this book, he was introduced to Marvel Comics editor Axel Alonso who hired him for his next mini-series. I also know he is reliable because he went on to write more than 17 comics for Marvel before writing this book, and he continues to write for Marvel today. The category of this story is Interlocking Episodes because this book has multiple stories about different things. These stories are all about Deadpool and fighting crime. 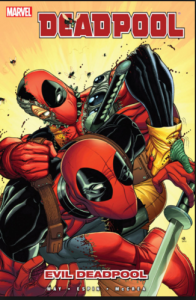 Some graphic comics about Deadpool have a lot of gore but some only have a little bit of gore. The books with a lot of gore are the books that are longer but the ones with alot of gore are shorter than the ones with less gore. The word gore means bloody and violent. These books are not all bloody and violent; they are also funny. The are funny because Deadpool makes so many jokes. One of the jokes he made is “ I got the guns” referring to his muscles. In conclusion, this book’s category is Interlocking Episodes because this book has multiple stories within the same book. Deadpool is a middle-aged Superhero from New York who has to convince the NYPD and Captain America that there is a clone of himself causing mischief. This 123-page graphic novel, written from the 1st person point of view, shows the struggle to convince someone that something is true when there is little proof. Recommended for readers 12 – 15 years old. “…I just escaped from a mental institution an’ all…” (3). “Yep! ’cause I’m a baller like that” (20). “Today, I want something on my desk this afternoon” (59). “…he recently escaped from a British Maximum Security Prison” (69). “…we’ve been monitoring Deadpool’s movements via satellite for the past seventy-two hours” (72). “Bip – Bip – Bip – Bip – Bip – Bip” (98). “Klik – Klik, Klik” (30). “Blam, Blam, Blam, Blam, Blam, Blam, Blam, Blam” (29). “We once got lost on an escalator” (54). My connection to Deadpool: Evil Deadpool by Daniel Way is text to text and text to world. This book reminds me of other Marvel books I have read in the past. This Marvel book talks about Deadpool and how he convinces the NYPD and Captain America that there is a clone of himself. I have read multiple books about Captain American and other Marvel characters. Another Marvel book is Deadpool Kills the Marvel Universe. These two books both have humour but they also have alot of violence and blood. In this book there are alot of guns and bombs used. Deadpool threatens that he was going to blow himself up with a child in the car to get Evil Deadpool’s attention. These two Deadpool books remind me of the other Deadpool books. Evil Deadpool also reminds of the recent killings in France. The reason why this book reminds me of this situation is because there were some deaths in the book as well as in France. The difference between the book and the France killings is that there were only a couple deaths in the book, whereas in France there were hundreds killed. In the book, Deadpool is looked at like a terrorist and Captain American said “you are lying and a terrorist” (47). The killings in France were caused by terrorists. In the book, Evil Deadpool acts like a terrorist and tries to kill people, just like in France. The military and police force are like Superheros, just like Captain America and Deadpool. The military and police are acting like them because they are searching for the terrorists in France so that it doesn’t happen again and no one else gets hurt or killed. Deadpool and Captain America are trying to stop Evil Deadpool from harming people, too. The recent killings in France remind me of this book and how the military and police are acting like Deadpool and Captain America. Citation: Trottier, Maxine. Migrant. Toronto: Groundwood Books, 2011. I could count on this picture book to be entertaining because I have heard of Groundwood Books, the publisher, before and it has a good reputation. The book has also won the Best Illustrated Children’s Book Award by the New York Times and was a Governor General’s Literary Award (Illustration) Finalist. Migrant shows a main character pattern. It focuses on the story of a young girl, Anna, whose family is always moving between Mexico and Northern Canada. She wonders what it would be like to stay in one place instead of travelling every season. The story tells what this German-speaking child sees and feels about this foreign country. Using a ton of metaphors and similes, the author, Maxine Trottier, compares Anna’s life to different animals and what their lives are like. Anna has trouble staying busy while her family works because she is too young to do anything. Anna, a little girl whose family travels from Mexico to Canada, feels like a bird who is constantly flying back and forth, north to south, when the seasons change, She wonders what it world be like to stay in one place. This imaginative picture book, beautifully illustrated, is recommended for readers 4 to 14-years-old. 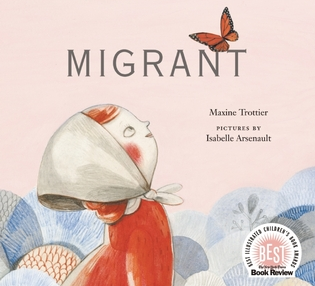 My connection to Migrant by Maxine Trottier is text to world. Previously in our Social Studies class, we learned about early human migration. Approximately two million years ago, people started migrating from Africa into Asia and then eventually to the tip of North America and the rest of the world. The main character, Anna, is a young girl who comes from a family of migrant workers from Mexico. According to Trottier, “Low German-speaking Mennonites from Mexico are a unique group of migrants who moved from Canada to Mexico in the 1920s and became an important part of the farming community there. What is interesting is that I have learned that in our town there are still some local companies that will hire migrant workers for each season. For example, an aerospace facility and some farms have hired seasonal workers to increase their labour force. Unlike Anna, many migrant workers in today’s world are able to apply for permanent residency and create a new life in our country. In the case of Anna’s family, they travel back and forth from Mexico to Canada, and do not have the living and working conditions usually reserved for residents. This constant lack of stability for Anna has therefore created a lack of a proper childhood — at least one that looks like the one I had — and this book both beautifully illustrates and communicates the hardships of a child of a migrant worker in so few words. Bouchard, David. The Colours of British Columbia. Vancouver: Raincoast Books, 1994. I know this author is reliable because he has written five other books including the best selling If You’re Not from the Prairie… and the award-winning The Elders are Watching. I also know he is a reliable because he is now a school principal in West Vancouver and a popular storytelling performer in schools throughout Canada. The category of this perfect picture book is repetitive pattern, informational pattern and rhythm-rhyme pattern. It is a repetitive pattern because the author uses “I remember” more than once at the beginning of sentences. It is also an information pattern because it tells readers about beautiful British Columbia and the wonderful colours in the towns in which we live. This amazing illustrated picture also contains a rhythm-rhyme pattern because the author uses “een” words in the same sentences. The author also uses “ame” sounds and “o” sounds. This wonderful picture book describes, in words and pictures, famous sites in beautiful British Columbia. This book has amazing paintings which I am sure readers would love. It is recommended for readers of all ages. 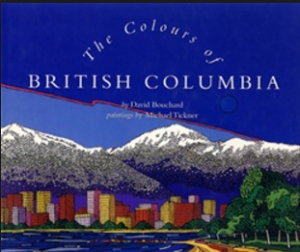 I can connect to this picture book because when I was little I traveled around B.C with my family. I hardly remembered what anything looked like, but reading this book reminded me of all the beautiful sights I saw so long ago. Reading this picture book also reminded me of all the colour we have here in B.C. I guess I still travel B.C, just not as much. But I still go in summertime, for a couple of weeks, to Kelowna and places like Peachland, West Bank, and Summerland. (One summer I even went to Rattlesnake Island, in the middle of Okanagan Lake, to a place where customers can park their boats right in front of a restaurant!) Every summer, I also go up to 100 Mile House and stay with my grandfather for a couple of weeks. We travel up to Williams Lake and Prince George and go fishing, quading and horseback riding. I love travelling to far-away places. I like seeing the beauties of nature and visiting all the little towns. This picture book by Bouchard brought back all those wonderful memories.